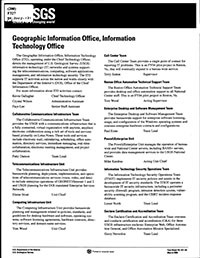 The Geographic Information Office, Information Technology Office (ITO), operating under the Chief Technology Officer, directs the management of U.S. Geological Survey (USGS) information technology (IT) networks and systems supporting the telecommunications, computing, software applications management, and information technology security. The ITO supports IT activities across the nation and works closely with the Department of the Interior's (DOI), Office of the Chief Information Officer. For more information about ITO activities contact: Kevin Gallagher: Chief Technology Officer, Crystal Wilson: Administrative Assistant, Faye Lee: Senior Staff Assistant.